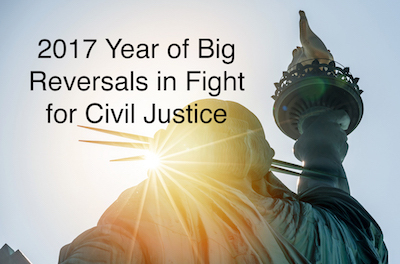 As you will read in this month’s newsletter, 2017 was a tough year for civil justice. But here’s one bright spot. Those who see and deal with the devastation of opioid addiction firsthand are now turning to the justice system. So far 10 states and dozens of cities have sued opioid drug makers, alleging that these companies helped trigger the opioid epidemic by minimizing the risk of addiction and overdose. The hope is that these lawsuits will spur changes in the opioid industry just as they did in the tobacco industry, providing resources for prevention and treatment programs nationwide. Normally at this time we highlight the year’s greatest victories for civil justice. Like forcing automakers to admit that they sold vehicles with exploding airbags or faulty ignition switches. Like holding accountable those who cover up the use of cancer-causing asbestos. Like shedding light on medical devices that fail or cause debilitating side effects. Yes, those battles and many more continue, but 2017 might be remembered instead for several troubling reversals in the fight to protect the health, safety and legal rights of all Americans. You should know why. The money returned to Americans by the Consumer Financial Protection Bureau (CFPB), which is under fire by Wall Street and Congress. NPR investigates a growing movement to hold providers accountable for patient opioid addiction.